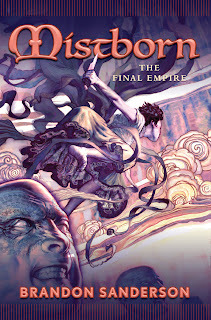 I had heard good things about "Mistborn: The Final Empire and its sequels from my brothers, so I went into the experience with fairly high expectations. I think I got what I was expecting. It's not so cookie-cutter like a lot of fantasy is. Brandon Sanderson starts off with the question "what if the epic hero who was to overthrow the evil before it took over the world failed in his quest?" A thousand years later the world is not so pretty a place, and people are enslaved to the ruling class, and THEN a hero arises. That in itself wasn't enough to make a totally unique story line - it ended up kind of like Star Wars episode IV in some respects - you have an orphan hero who is awaken to latent powers the average person doesn't have, who rises from obscurity with a more experienced mentor who has suffered great personal loss to the evil ruler. So the basic framework is similar, but I was still pleasantly surprised with how it all came together. I think what made it more unique is the kind of powers this centers around - rather than your typical magic or dragons or the force or other such run-into-the-ground powers, this book centers on Allomancy - certain people can ingest metals and use powers the derive from them - some can have great strength, others hightened senses. Some can influence emotions, some can push or pull metals, and some can do all of it. That's just not something I've seen before, so it made it cool. The audiobook production is not bad. I wasn't a huge fan of the reader at first - his tone seemed like he was trying to sound dry and witty all the time, but I got used to it pretty quickly and settled in to enjoy the story. He doesn't detract from the story like some do, but doesn't really add to it either. Still, all in all, an enjoyable book - probably 8 out of 10.